Preemption systems are designed to automatically process a request for a green light as an emergency vehicle approaches a signalized intersection, so the emergency vehicle is given the right of way. This technology allows for faster response time and safer travel. Most standard GPS preemption systems rely on a static, pre-set timing plan, which typically requests a green light 30 seconds prior to the arrival of the emergency vehicle at a traffic signal. The plans are based on distance, which works well under normal conditions. However, the distance factor does not account for higher than normal congestion, which can easily negate the benefit of the preemption system and cause a new set of issues for motorists and the emergency vehicle. 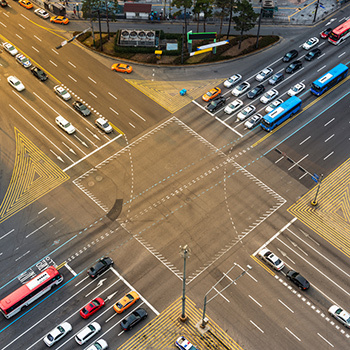 Adaptive preemption is a new technology that uses real-time information to intelligently adjust the preemption request based on the real-time traffic situation. It has the ability to effectively monitor an emergency vehicle’s speed as well as current, in real-time. In contrast to traditional GPS based preemption systems, adaptive preemption is able to determine the estimated time of arrival at the intersection, and then adjust the preemption request if the vehicle is slowed by congested traffic. Instead of relying on predefined range and ETA, adaptive preemption can proactively change lights along the entire route. By looking at the entire run, the technology can sense if a vehicle in a code-3 status (lights and sirens) and has slowed down, but outside of the “standard” ETA triggering range. When it sees this condition, the system will advance the preempt request, beyond the normal range or ETA that would be expected if there weren’t heavy congestion, at intersections well ahead of the vehicle’s current position so that congested traffic is moved out before it arrives. The addition of this adaptive technology into a GPS preemption system allows for even faster response times, reduced liability, and fewer accidents at the intersections.